Today, we’re looking at Mega Charizard Y (XY FlashFire 13/106 107/106, XY Evolutions 13/101 101/108). Why though? Seems like Mega Evolutions have been retired since Sun & Moon Base Set was released. While that may be true, we got until September 1st until the last remaining XY expansions are being rotated from Standard for good. Might as well knock out some of the few XY related cards that I enjoy looking at while I got the chance. And this card has not been reviewed by the Pojo review crew. Being a Mega Evolution means you’ve got no choice but to end your turn the moment you Mega Evolve one of your Pokemon. However, with Charizard Spirit Link, you avoid ending your turn and continue your usual business until you declare your attack. 220 HP for a Mega Evolution seems to be in the middle; the highest was 240 (see variety) while the lowest is 190 (see Mega Diancie EX). Being a Fire type means some support and exploiting weaknesses, though that won’t matter to this card, as we shall see. Probably the true counter as a anti-Fire Pokemon is Araquanid, whose a Water Bubble prevents all damage done to this Pokémon by Fire Pokemon. Water weakness is expected, and that means an auto loss to Greninja BREAK variants and other Water decks. And a retreat cost of one is somewhat easy to pay, and can be shaved off by Escape Board. All Mega Evolutions carries only one attack, and this card is no exception. Crimson Dive costs RRCCC, which is a lot of investment, although supported by Double Colorless Energy and BlackSmith. But that still leaves it short by one Energy. Another trick is Kiawe, which can search your deck for FOUR Fire energies and attach it to one of your Pokemon. With the manual attachment, that finally meets the attack cost. You’ve got to deal with losing an attack due to abruptly ending your turn after using Kiawe, and loading energies in one basket means Gardevoir-GX and Frost Rotom can punish you for having too many energies. Gardevoir-GX will need just one Energy and Choice Band while Frost Rotom’s Frost Crush OHKOs Charizard-EX. Depending on the situation, it can or not be a good idea. This steep energy cost means that Mega Charizard has to do something amazing, and it actually does to some extent. Crimson Dive does 300 damage! That’s enough to OHKO 99.9% of the Pokemon in the TCG before factoring alternating HP scores and damage reduction. Wailord-EX backed with Fighting Fury Belt and Parallel City will actually survive with 10 HP remaining! Such a thing can be countered by Field Blower, though. The drawback is that this Pokémon does 50 damage to itself. The self damage isn’t good. From 220 to 170, your opponent has an easier time to finish you off, and even more so at 120, 70, etc. Which is why this set also released Protection Cube, which is a Pokémon Tool that prevents self damage, which is perfect for this Pokémon. With the ability to almost OHKO anything, you don’t need Choice Band or other damage boosting item; you can run a bit defensive. Oftentimes, however, that sort of damage is overkill and Charizard doesn’t trade prizes well. Sure, you can OHKO EX/GX for easy prizes, but against single prize attackers, it’ll take some work to grab prizes one by one. To get to M Charizard EX, you have to evolve from Charizard EX. There are four versions of those cards, all of which are Fire types with 180 HP and weak to water. Charizard-EX (XY FlashFire 11/106, 100/106, XY Black Star Promo 29) has a retreat cost of two and has two attacks. Stoke requires a coin flip and if heads, you search your deck for three basic energy cards and attach it to this Pokémon. Fire Blast does 120 for RCCC and a single energy discard from itself. Stoke could be a good lead to Crimson Dive but still suffers the same problems Kiawe had. Charizard-EX (XY FlashFire 12/106, XY Black Star Promos 121, XY Evolutions 12/108) has a retreat cost of two with two attacks. Wing Attack does 60 for CCC while Combustion Blast does 150 for RRCC and you can’t use that attack on your next turn. Probably the reason why it took 10th place is that it can function itself as a good EX that doesn’t need to Mega Evolve, and is paired with Fiery Torch and Blacksmith. 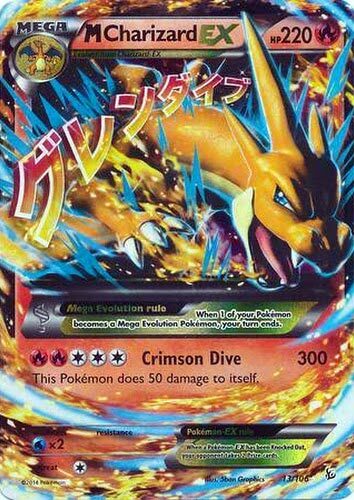 Charizard-EX (XY Black Star Promo 17) has a retreat cost of three with two attacks. Mega Ascension costs RC searches your deck for M Charizard EX and put it onto your hand. Brave Fire costs RCCC for 120 damage while doing 30 to itself. The search can be better left with items to do their job. Charizard-EX (XY Generations 11/83) has a retreat cost of two with two attacks. Flame Cloak costs RC for 30 damage and puts a fire energy from the discard into this Pokémon. Burning Breath costs RRCC for 80 damage, plus 40 more for each heads. By flipping two coins, you could be doing the flat 80, 120, or 160 damage. There are two other Mega Charizard cards. M Charizard-EX (XY FlashFire 69/106, 108/106) is a Dragon type with 230 HP, weak to Fairy, and a retreat cost of three. Wild Blaze costs RRDCC for 300 damage while discarding the top 5 cards from your deck. While OHKOing almost anything and avoiding self damage, losing cards from your deck is never a good thing. You will miss out of cards that you could’ve use it later on. M Charizard-EX (XY Generations 12/83) is a Fire type with 220 HP, weak to water, and a retreat cost of three. Heat Typhoon costs RCCC for 100 damage. For each Fire energy attached to this Pokémon, you flip a coin. It does 50 more damage for each heads. With a minimum of RCCC, you can do either 100 or 150 damage, but with RRRR, it could be between 100 to 300 damage. Even with Victini’s Victory Star improving your odds, it doesn’t guarantee you the desired result. When looking at other options relating to this card, this card is better than both of it’s X counterparts. Still, that doesn’t mean much in the current metagame, where it revolves with very few basic GX beatsticks that can deal damage much efficiently than Charizard (looking at you Buzzwole and Lucario). Which sadly makes this card see little to no play, not even Charizard Spirit Link to help avoid losing a turn. In Limited, this could be a must run depending on multiple expansion that were released regarding this card. For XY FlashFire, losing a turn hurts, but you probably didn’t have enough energy to meet that attack cost anyway, making the clause inconsequential. Protection Cube is in the set, so you can enjoy avoiding self damage while slowly fueling up the attack via Blacksmith and Fiery Torch. Good luck getting all the moving pieces within six booster packs. But for XY Evolutions? Although you’ve got Charizard Spirit Link, there’s no Protection Cube, so it’s staying power is limited. This makes Limited hard to score if I don’t separate it. Conclusion: One thing I’ve learned about Charizard cards in the Pokémon TCG is that it does a ton of damage for a much steeper cost. And while taking OHKOes are nice, being a two-prize Pokemon that costs five energies to use on top of self damage is asking for too much. If you’re able to accommodate this massive attack, then give this a try. Otherwise, skip it. Next article[Goat Format] Mefist the Infernal General – YuGiOh!